I know this little e-card meme is just supposed to make me laugh. But it bugs me. 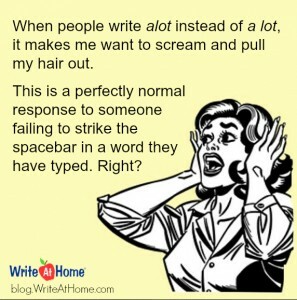 The tone exemplifies what I dislike most about grammar snobbishness. Why would anyone be even a little bothered by someone eliminating a space between a and lot? The thing is, it’s just not so obvious. Not even to normal, intelligent people. I like ham sandwiches a little, Bob likes them a lot. But acantaloupe? aporkchop? If those examples are supposed to reveal how ignorant writers of alot are, it doesn’t work. They are nouns with introductory articles, not adverbs. There’s no logical correlation. Sure, lot can be a noun too: A lot is a plot of land. But nobody confuses alot for a lot in this kind of usage. Young people confuse them because a lot of adverbs start with a where a could be misunderstood to be an article: again, aboard, anew, afresh, aloud, around, askew etc. These words are natural parallels to a lot. We never write a gain, a board, a new or a round. The mistake therefore seems perfectly logical. The truth is, constructions like a lot, a little, and a few are odd. They function as compound adverbs, but they look like nouns with indefinite articles. They act like single words, and we have lots of adverbs that were formed by mashing compounds into single words: already, altogether, meanwhile, moreover, etc. A lot is quirky and idiomatic and therefore naturally confusing. I’m not suggesting we should accept alot as an alternative spelling. I’m just saying the confusion is perfectly rational. More rational, in fact, than the dumb analogy in this meme. I know. It’s only a comical meme. I’m surely taking it too seriously. I just don’t like humor that reinforces the general condescension of grammar snobs. I have created some revised versions of the meme below. I like these better. Bloggers love comments. A lot! Leave yours below. Just a thought. I see alot pretty often. I don’t ever see abit or alittle. Why? Just frequency of the expression? I have a sense that people who write alot are not making typos, but see it as simply correct. As to why, I suppose it could have started with typos, but I’m inclined to guess it was by analogy with the many words that begin uncontroversially with “a”. About, around, allot (! ), above and so on. Just a guess…. Love all of this. I am a court reporter, and Dressage rider. I have spent quite a bit ( a lot ) of time explaining the English language. You have delved far deeper into many a still water. understanding between you and your horse? Thank you so much! I am a reasonably intelligent adult, and I have always wondered why this is a difficult thing to keep straight. Now I understand the source of the confusion. Very insightful observations. Your revised versions made me laugh, and I appreciated your analysis of the original. Our kids especially don’t respond well to a condescending attitude when we’re correcting them. A gentle explanation (along with some humor) works much better!